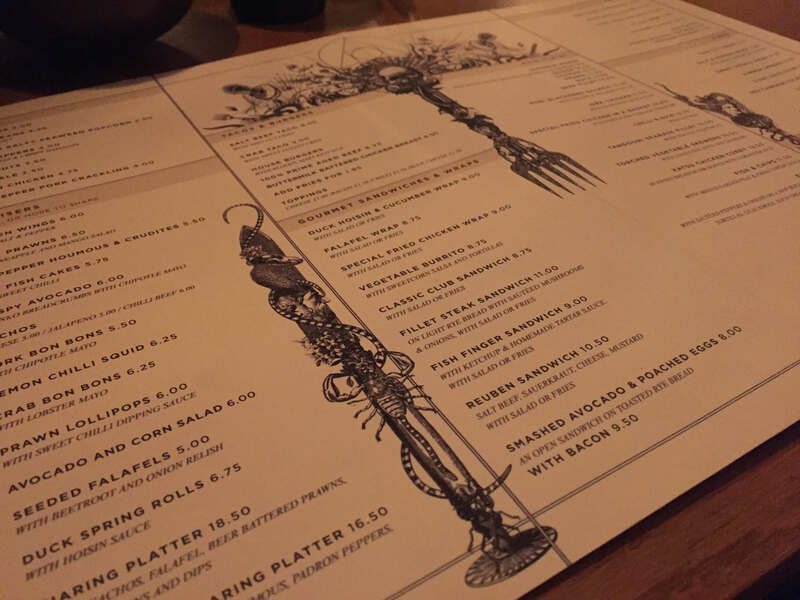 The Alchemist, Media City, Manchester – The Asgards have landed.. and they make great food! Manchester, home of the industrial revolution and the northern powerhouse is located inland, so it was a remarkable feat of civil and mechanical engineering that the Manchester Ship Canal was ever built. It was opened in 1894 by Queen Victoria. Today Salford Quays is home to the Imperial War Museum, The Lowry Centre and now Media City. This is a tourist hot spot overlooked by Manchester Uniteds Old Trafford ground, surrounded by hotels like the Copthorne and countless restaurant chains. So when I heard that there was a new restaurant on the bridge between Media City and The Lowry Theatre I was confused. A restaurant on the bridge seemed unlikely.. but sure enough, as if deposited by the Asgards, there, on the bridge, is a golden structure. It looks mystical, theatrical and from something you might see in the TV series Stargate! More than science fiction, the name suggests that those inside are people versed in or practicing alchemy. 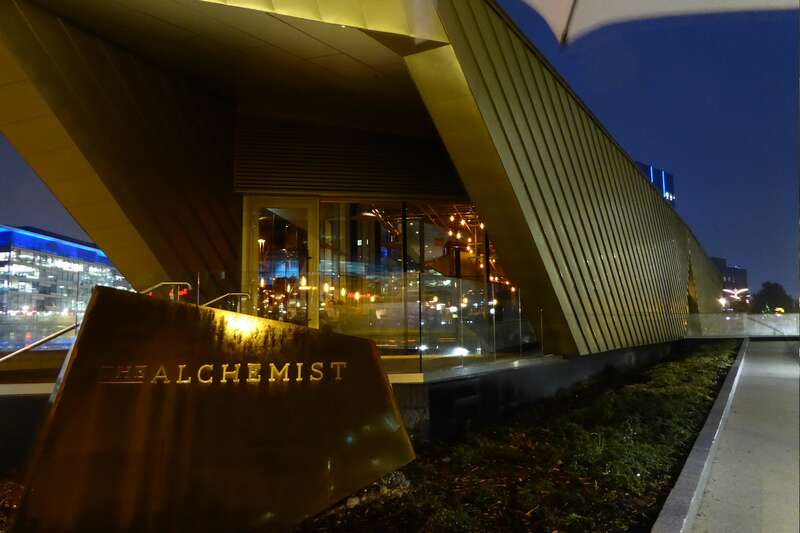 The Alchemist from the outside could easily be considered a visitor attraction that presents a form of chemistry and speculative philosophy once practiced in the Middle Ages and during the Renaissance. Surely this unexpected structure must be concerned principally with discovering methods for transmuting baser metals into gold and with finding a universal solvent and an elixir of life! 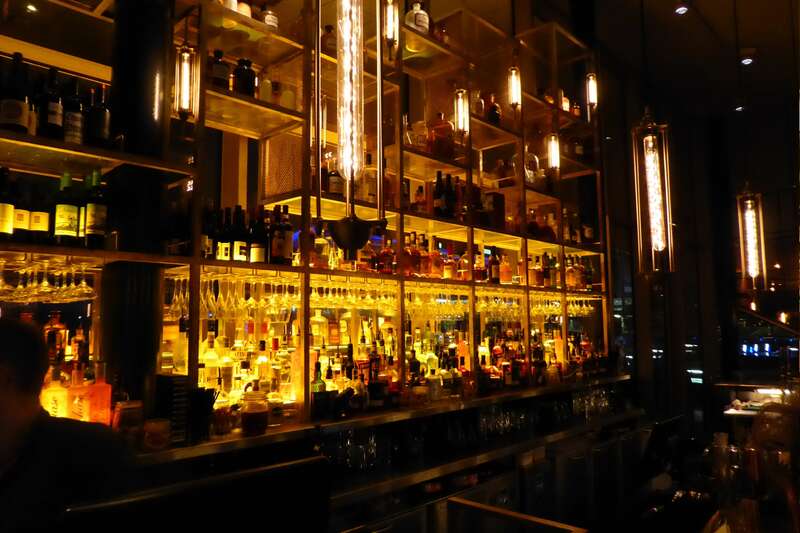 However, once inside, of course you are presented with an unusual restaurant and bar. The place is carefully designed to continue the theme with metallic square frames hanging from the ceiling to complement the designers desire to pull this fun theme together. 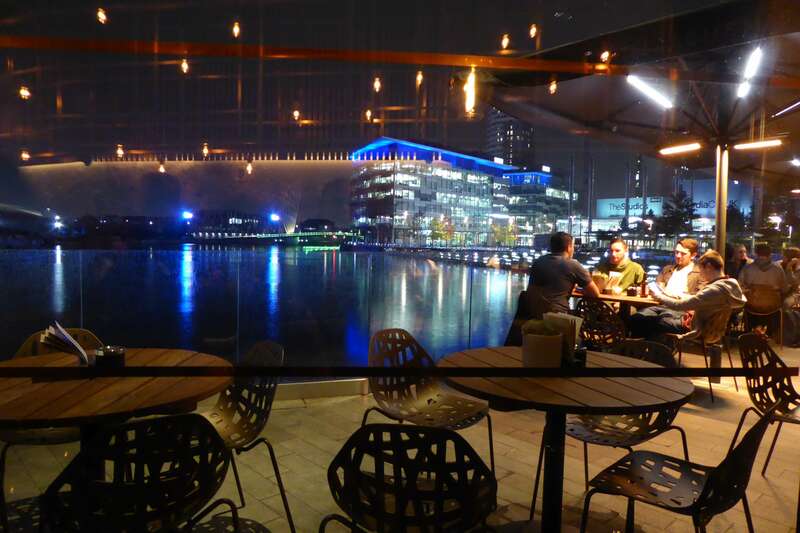 We were shown to a table next to windows overlooking an outside heated deck area and bar with unusual views that stretch out across the Salford docks, Media City and beyond. The colourful lights adding to the atmosphere. Our raised wooden table with raised stool like seating was surprisingly comfortable. 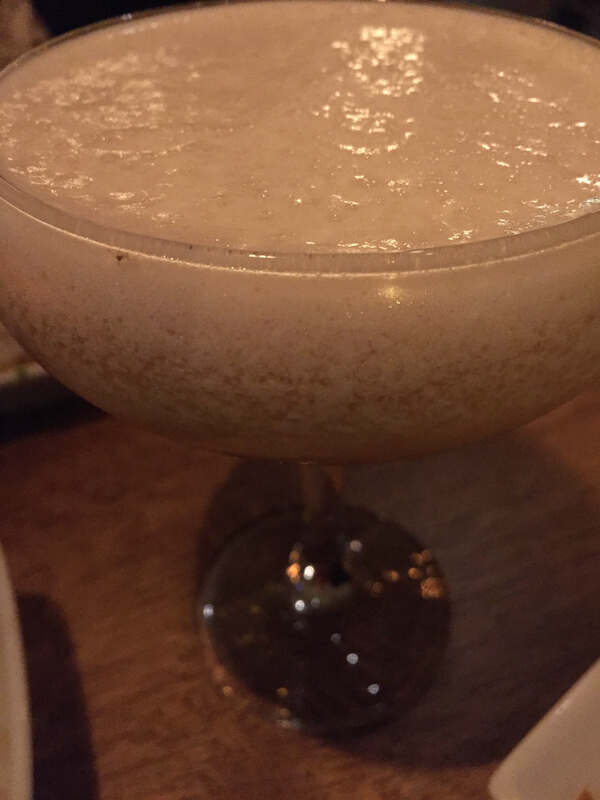 and trust me when I say you’ve likely not seen drinks like these! I tried the Strawberry Colada made with strawberry, cocucunut, lime and pineapple. Whilst my wife tried the Mint Aero made with Appleton signature rum, Briottet white mint, apple, chocolate and creamy malt. 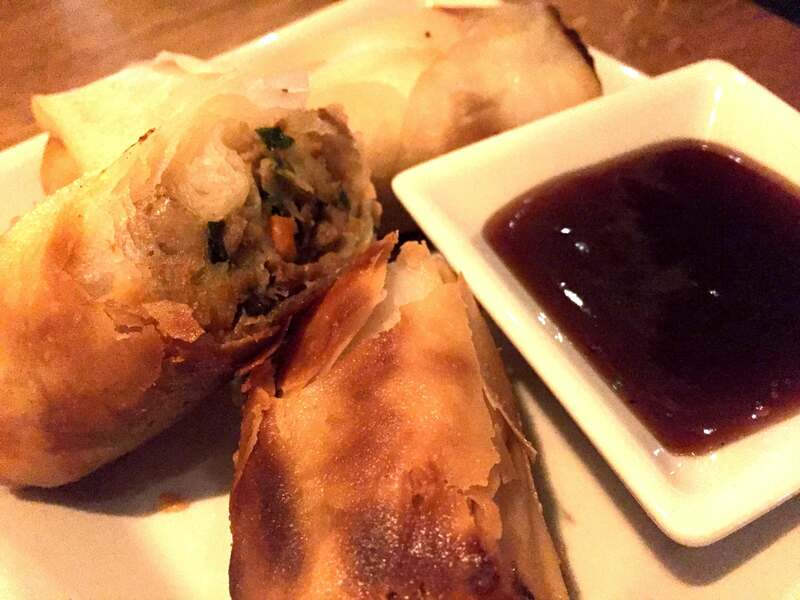 But our focus turned to the food. The Alchemist takes its inspirations from around the world, presenting a wide range for culinary dishes to suit all tastes. 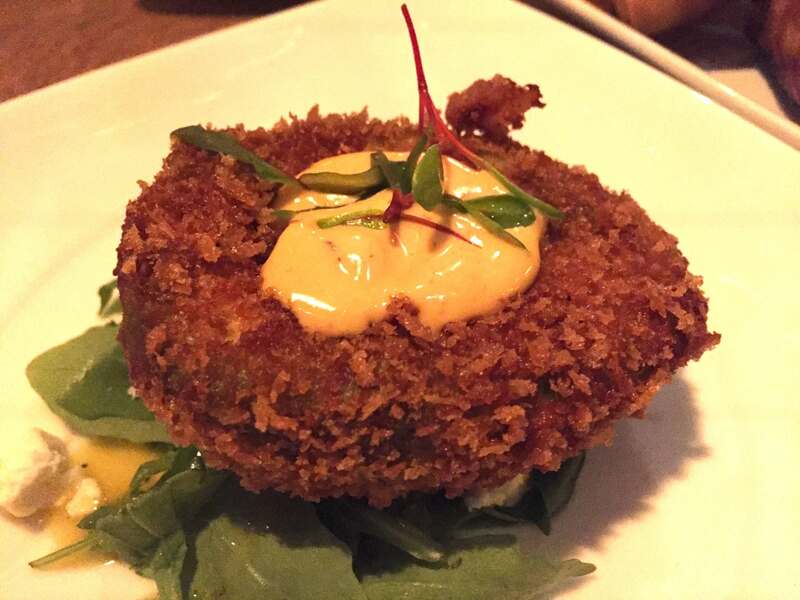 We chose the Crispy Avocado in panko breadcrumbs with chipotle mayo, Padron Peppers with salt flakes and crispy shallots and a portion of the Duck spring rolls. The food was tasty, but presentation here is lacking. 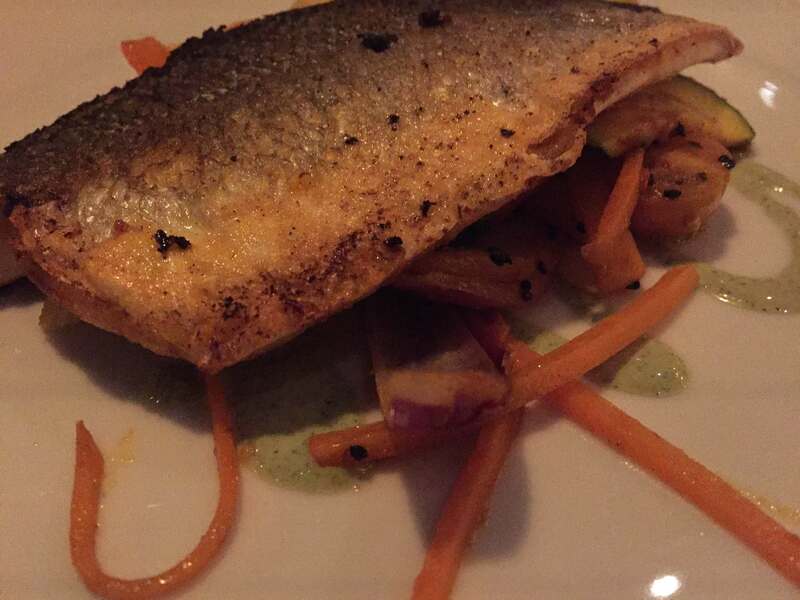 For the main courses our waiter Will recommended the Tandoori seabass fillet with stir fry vegetables. But whilst this was delicious, one fillet left this dish feeling short of the other fillet. 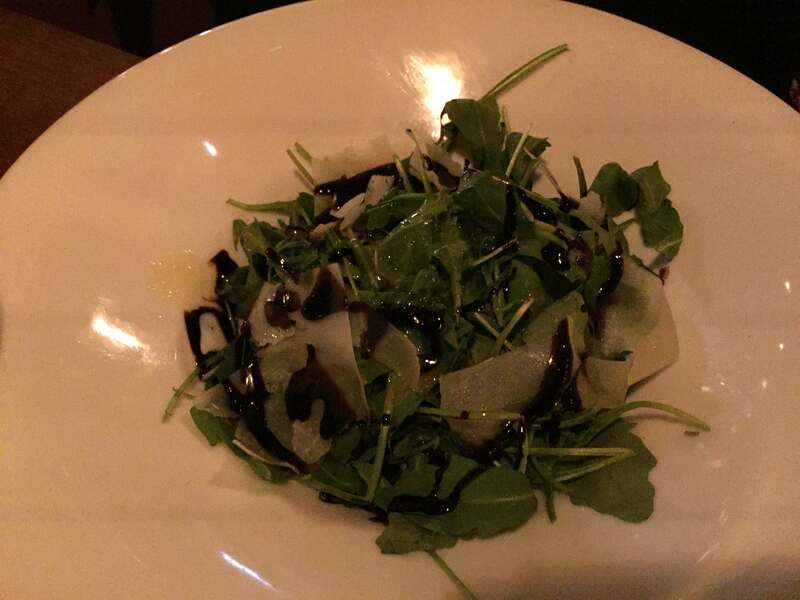 Fortunately we ordered the Rocket and Grana Padano salad which was fresh and great value. 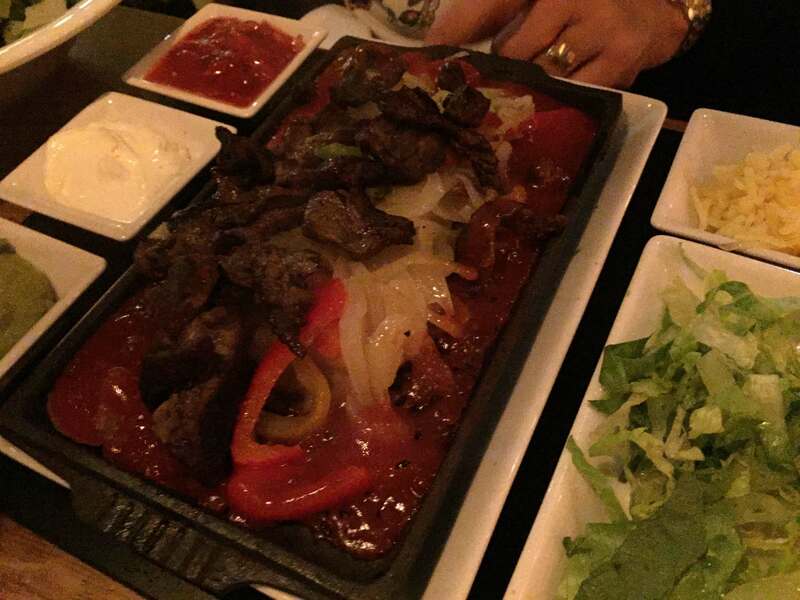 For the other main we chose the Beef Fajitas on a skillet. This was the same price as the seabass and yet felt well thought out, not leaving us feeling hungry at all. This dish also came with four tortillas that really made this dish a winner. We added a side of sweet potato fries too. 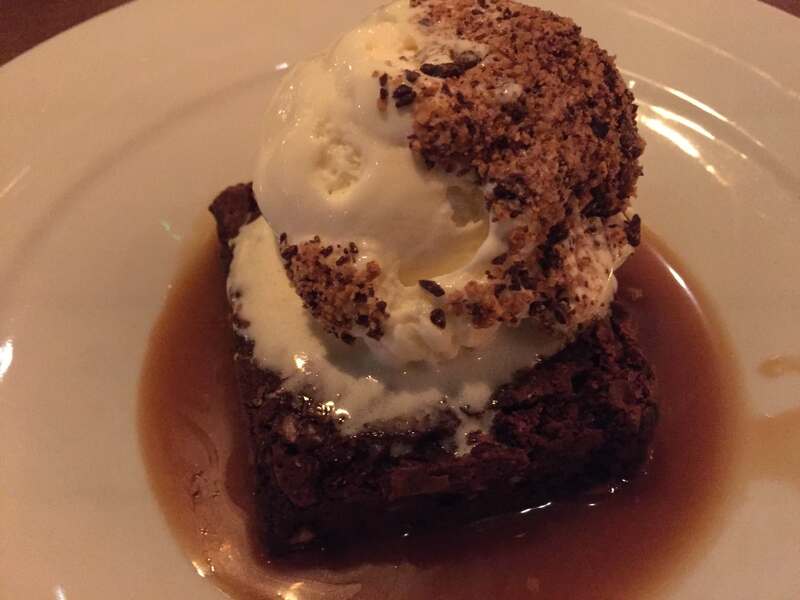 We left just enough room to try the chocolate brownie and sticky toffee pudding. 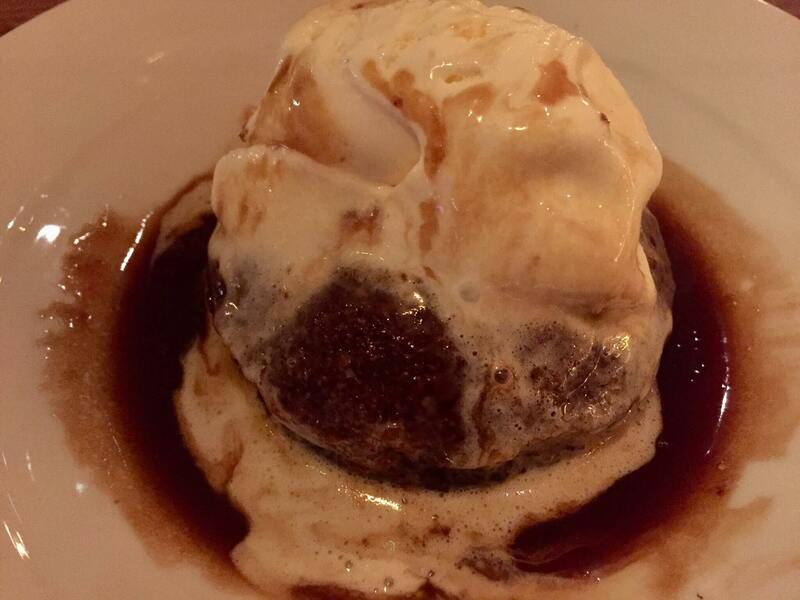 Both were delicious but presentation could be improved. 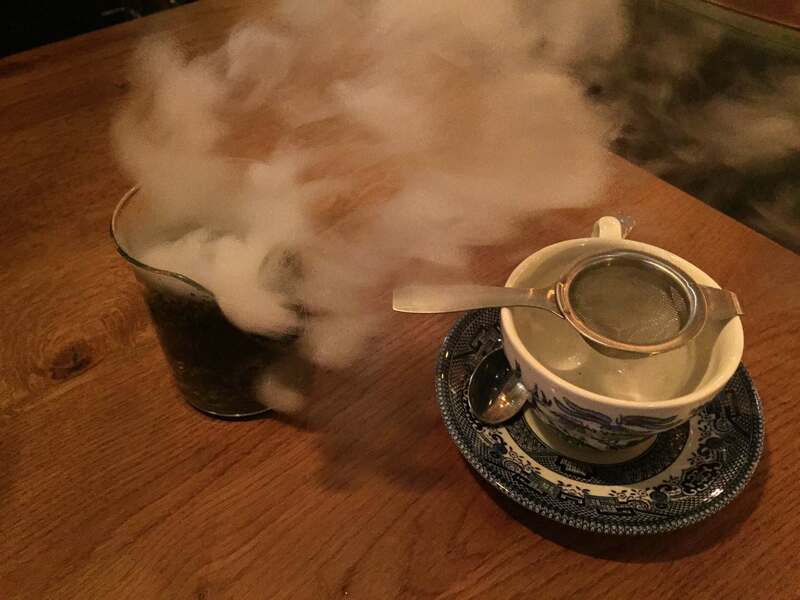 Over all The Alchemist is a fun theatrical place, loads of atmosphere and certainly worthy of a visit for breakfast, lunch or dinner. 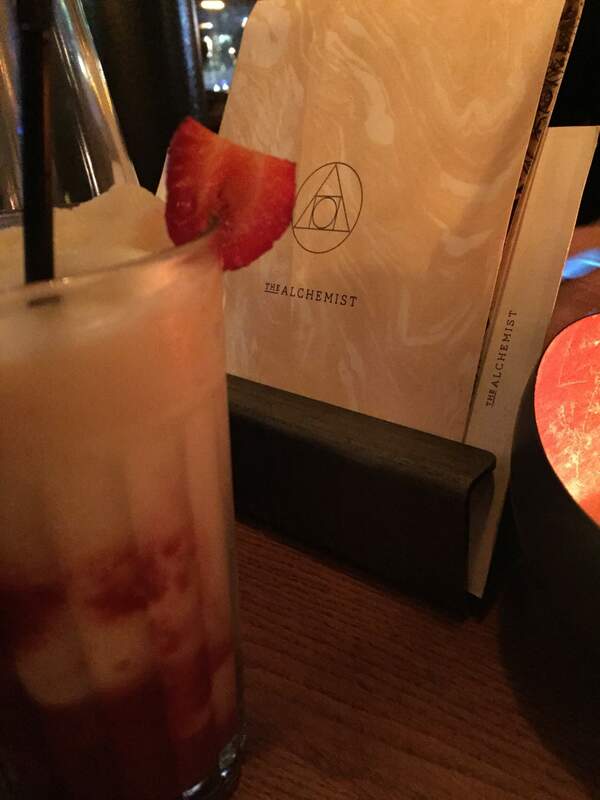 The Alchemist should be on your places to visit.. it’s creative and desperate to show off its talented bar skills. We visited Salford Quays, but this chain is on a roll… it has sites popping up all over and has big ambitions. 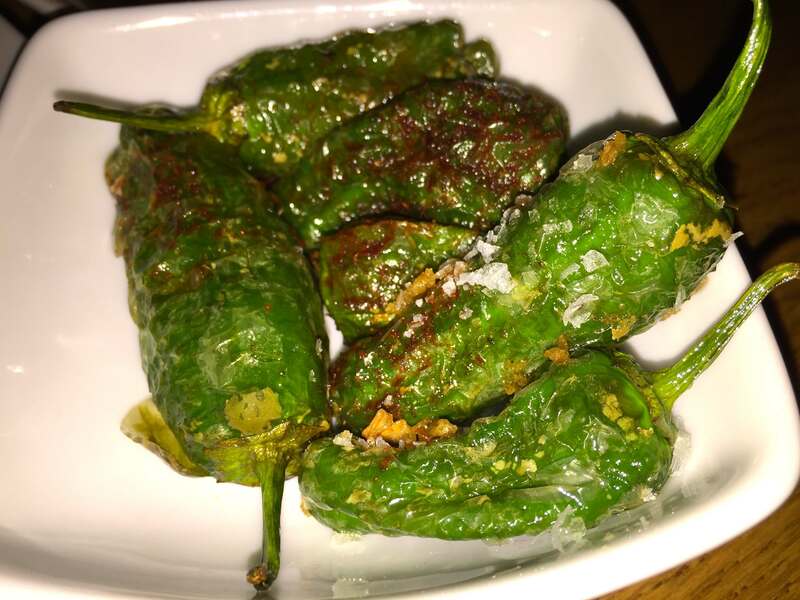 Take a look at their website here before making a booking, you’ll be glad you did because this is a busy place!